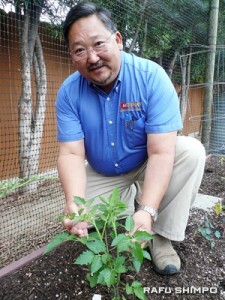 May 1-2 — Tomato expert Steve Goto will talk about everything you need to know to grow organic tomatoes this Saturday at 11 a.m. at the Los Angeles Garden Show at the L.A. County Arboretum & Botanic Garden, 301 N. Baldwin Ave. Arcadia. His Top 2010 Tomato Picks (based on the favorite tomatoes at his tastings from the year before) have become legendary so after his talk, be sure to visit the Tomatomania booth and Arboretum Plants Tent where there will be lots of plants for sale. Steve Goto the "Tomato King"
The LA Garden Show is the largest outdoor gardening event on the West Coast that has evolved into a prestigious community gathering, as well as a premier industry event for gardening aficionados and professionals in Southern California and beyond. The event illustrates innovative and environmentally responsible garden design and shares knowledge of eco-gardening practices through workshops, lectures and demonstrations, as well as provides specialty plants, books and home gardening elements in the Marketplace. This year’s event is a tribute to the home gardener and will be an active “How to” guide for living a green gardening lifestyle in Southern California. Workshops, Lectures, and demonstrations will range from creating edible gardens to designing with California friendly plants, to composting and making water-wise choices, the LA Garden Show will provide the essentials for the professional and novice home garden. Admission: $3 to $8, Free for Arboretum members. Early Admission for Arboretum Members is 8 a.m. Free parking. Preferred parking $10. For information, visit www.lagardenshow.com.